Comedian Ahn Sang Tae made a surprise cameo appearance in Rooftop Prince, revealing insane presence. In the episode 2 of Rooftop Prince broadcast on March 22nd, 2012, Lee Gak (Micky Yuchun) and three loyal servants (Lee Min Ho, Jung Suk Won and Choi Woo Shik) were sent forward in time to modern era to appear in the rooftop apartment of Park Ha (Han Ji Min). On the day’s episode, Park Ha and Lee Gak come together to the front of Donhwamun Gate of Changdeokgung Palace. Although they shout, “Is there anyone, open the door,” but nobody responses. 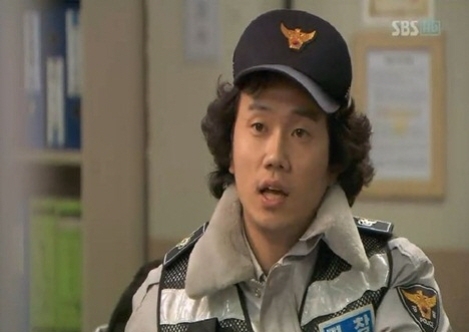 When they’re panic-stricken, the sergeant Ma (Ahn Sang Tae) appears. Sergeant Ma berates them to “Go home quickly after filming! What’s for staying in front of cultural heritage. Hurry up and go,” provoking laughter. For the cameo of Ahn Sang Tae in Rooftop Prince, netizens said, “Worth of the highest decorative effect,” “Really funny” and so on.